Mary Tuomanen as Cassius in JULIUS CAESAR. Costumes by Jane Casanave. Photo by Shawn May. Was Brutus an honorable man? The debate was a common rhetorical device in 16th-century schools, and Shakespeare uses this familiar conflict to frame his JULIUS CAESAR, now in production by Quintessence Theatre Group. The play is set in the final death throes of the Roman Republic. Fresh off of his bloody victory against his frenemy Pompey, Caesar is at the height of his powers and chafing quite a few once-eminent politicians. Cassius convinces Caesar’s maybe-son Brutus to join in a conspiracy which successfully murders the would-be tyrant. After some powerful speeches by Brutus and Caesar-partisan Antony (“Friends, Romans, countrymen, lend me your ears”), the empire falls into civil war, ending with the deaths of Brutus and Cassius. 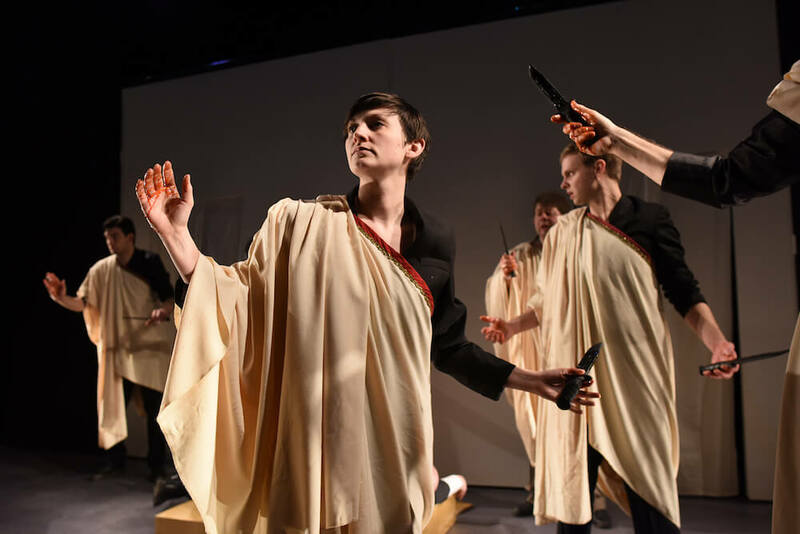 This spring’s production of JULIUS CAESAR by Quintessence Theatre Group, directed by artistic director Alexander Burns, doesn’t seem too interested in being a referendum on Brutus or his contemporaries. Here, Cassius (Mary Tuomanen) isn’t a silver-tongued villain or hero of republican virtue; he’s a proud man repeatedly humiliated by a proto-tyrant. Michael Brusasco’s Brutus isn’t a too-virtuous stoic; rather, he is almost aggressively average (the very fashionable hair is a turnoff, though; is this Brutus meant to be a dandy?). Both Antony and Octavius begin the play (seemingly) sincere and shocked by violence, and at some point, off-stage, learn to love bloodshed and power. Even Paul Hebron’s Caesar comes across not as a charismatic and magnetic leader, but pompous and hardheaded, perhaps a bit too comfortable in his role, and eminently stabable. So these main characters, in Burns’ production, range from inscrutable to obviously normal. Brett Ashley Robinson’s Antony in particular is difficult to read. Robinson plays the hard-partying Antony as a charismatic and powerful performer. The most entrancing moment of the production is her slow walk among the conspirators, shaking each one’s bloody hand, and ending up in the center of a knife-wielding circle; Antony should be terrified, but Robinson is all coiled, potential energy, and it’s the conspirators who look lost, as if they’ve suddenly found themselves having to corral a lion. Is Antony really lost in the moment, or is this all carefully staged? Robinson doesn’t let us know. 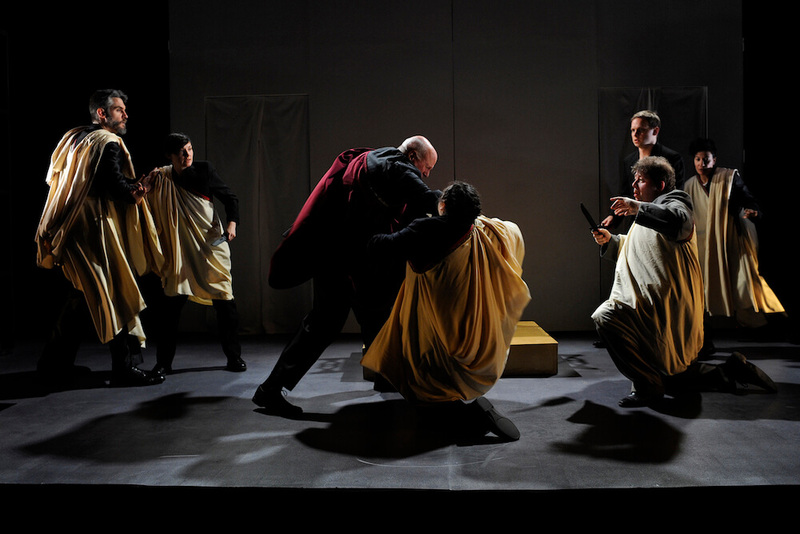 “And tell sad stories about the death of kings.” J. Alex Cordaro’s fight choreography for Caesar’s assassination. Photo by Shawn May. This subverts what is often seen as a larger anti-democratic theme in Shakespeare’s play. Burns cuts the opening scene, where two senators berate the unwashed masses for cheering for Caesar’s victory over Pompey, whom the people who had so recently loved. Shakespeare is often read as painting the people as fickle, mindless, less noble than deliberative Brutus, less intelligent than plotting Cassius. This is shown again in the people’s reactions to Brutus and Antony’s subsequent speeches over the body of Caesar, where the people are easily swayed from defending Caesar, to loving his assassin Brutus, to wanting to burn Brutus’ house to the ground. Burns keeps this scene in, and the people are adequately buffoonish, but watching them scratch their heads and run in fevered circles while Antony gradually raises the temperature of his denouncements of the assassins, I find myself curiously sympathetic to them. Antony’s motives are unclear to me. Is this practiced speaker an idealist outraged by the violation of Roman mos maiorum, or a partisan grabbing an opportunity at power, or a grief-stricken friend? All I know is, too much is happening too quickly for the populus to grasp it, and they’re doing their best to show their love for Rome. Perhaps Antony himself doesn’t know what’s happening, and is already swept up in the struggle for power and survival. Some framing items subtly suggest a larger power structure. The device that is used as a sort of subtitle/marketing pitch for the production, “all republics fall,” suggests inevitability; white-on-black captions which help tell the story also raise us, somewhat, above the drama of the individuals playing out on stage and remind us that things have to go this way. Is this an excellent production of Julius Caesar? It’s got a lot to chew on, some stunning scenes (watch Robinson and Tuomanen, in particular), and it’s ultimately better-than-average. I’d recommend it based on everything I’ve said above, but here are my quibbles. Burns’s attempts to ground us in Roman history by inserting sections from other, popular masques and plays of the time is interesting but probably a waste of energy; none of the added content really shines, we find ourselves learning about Cato and wondering why, and I doubt anyone really learned anything. Brusasco as Brutus is perhaps too normal; I don’t really know what to remember (except for that fashionable hair). Even his contemplation scenes, such as they are, seem decided from the start, which is a shame, because if we don’t buy his virtue he’s just a bungler, a mediocre white guy. He provides a rousing bout of rage in his touching argument with Cassius, but even at the end of their quarrel, he gives me no reason why Cassius should love him so much. I would have left this Brutus out of the conspiracy altogether.